Our line up of Industrial Automation Products are well-designed to carry out specific industrial tasks or processes such as Inspection, Measurement, Position Detection, Presence Detection and Identification, Control, Safety, Troubleshooting etc. Find out the right application solutions cater to your specific task! Scanning with the wide laser enables measurement of the cross-sectional shape without having to move the workpiece. Through-beam Laser-type Smart Sensor precisely inspects wire stripping process. The high-resolution, through-beam Sensor detects unstripped wire from the difference of wire diameter. The line beam is able to measure stably multi-points of the apex height of the rivet from the datum level. The laser enables eccentricity to be precisely measured from a distance. The Smart Monitor allows measurement data to be collected and stored on a personal computer. By measuring the height differences between two points, warped products that may cause contact defects in the mounting process can be eliminated. Four measurement points can be calculated at high speed with a Multi-Controller to enable inline, non-contact inspection of all units on the line. 2D Profile Measuring Smart Sensor detects PCB warping with a single measurement. Three-point height differences can be measured within the line beam, for PCB warping detection with a single measurement. Enables optimal roll pitch correction by precisely measuring the displacement amount of roller brackets. Height and width errors in foaming rise are measured together within the line beam. The thickness can be stably inspected because movement in the sensing object is absorbed by installing Laser Displacement Sensors above and below and using a Calculating Unit. The thin head also makes it possible to measure narrow spaces. Line-beam reflective Sensors measure from above and below to unify irregular surfaces and achieve stable measurement even when the dough moves up and down. The thickness can be easily and accurately measured by using a Calculating Unit and installing Sensors on both sides. The paper thickness is measured for the left and right edges, and the data is sent to a PLC for processing. Laser-type Smart Sensor measures the distance to the workpiece on both X and Y axes position shifting. The compact Sensor Head and small beam spot make it possible to inspect thin workpieces. The tip is detected without making contact, so positioning is done without scratching or damaging the nozzle. The measurement is unaffected by color or gloss, so eccentricity can also be absorbed. Laser-type 2D CMOS Smart Sensor for nozzle gap accurately measures sealing dispenser height to help improve production yield. A Sensor Head that separates the emitter and receiver while maintaining an integrated structure matches the measurement point with the nozzle drip point to enable highly accurate measurement. The amount of adhesive applied is monitored by the amount of incident light that is blocked by the adhesive extracted from the nozzle. A single sensor can easily inspect the intervals of up to 14 pins and edges can be specified. Laser-type 2D CMOS Smart Sensor provides simple detection of height differences even from a distance.The long-distance isplacement Sensor can detect height differences even in large sensing objects. The automatic sensitivity adjustment function makes it possible to detect transparent objects with high stability. Detection stability can be further enhanced by combined use with a Line-beam Sensor. Electronic component in standing position, which can cause misfeeds and downtime of production line, can be detected by measuring height differences. Laser-type CCD Smart Sensor accurately detects the notch positions of transparent glass wafers when used in transparent object detection mode. High-precision detection of eccentricity and vibration in processing machines is possible at a sampling speed as high as 150 µs. The 2D CMOS Laser precisely detects mirror-finish workpieces, such as the aluminum vapor-deposited side of hard discs. The mirror reflection model inspects surface wobbling in mirror-finish objects at a resolution as high as 0.25 µm at the edge of the table, where the change is greatest. Highly precise detection of the surface precision of steel plates is possible with a linear proximity sensor located at each of the four corners of the steel plates. The 2D CMOS laser achieves stable, multi-point co-planarity detection of black resins and glossy metals. Smart Sensor (High-precision Contact Model) precisely detects warping in hard drive chassis. The multi-point operation function reduces measurement time. Achieves stringent inspection of the displacement of the watchdog when the packing machine engages. The linear proximity model allows monitoring inspections of the displacement of a metal watchdog mounted to a pusher. Two clear pouches with a thickness of approximately 100 µm each are detected by mounting the sensor head to a resin plate to measure the clearance between the cylinder tip and the metal presser plate. In order to minimize changes in the surface conditions and holes of PCBs, the line beam averages the changes to detect double PCBs inserted together. Through-beam Smart Sensor detects double presser plates of crystal oscillators inserted together.Precisely detects the difference between one and two 80 µm thick aluminum plates by the amount of passing light. High-precision inspection of colored liquids can be conducted with area beam linear output, provided that detection from the upper side of the tank is possible. A parallel-beam laser displacement sensor ZX-L-N can detect single or overlapped plates easily. With this solution, inspection of several plates on each tray can be done and higher yield can be realized. If the inspection is done by using two sensors, one on the top and the other below the object, the effect of vibration is eliminated and stable detection can be actualized. Control of meandering can be attained with this 30mm measurement width laser-beam sensor. Changes in the amount of light received brought about by the meandering of the sheet enables precise checks on the width of rubber sheets. Bottom dead center of press machine with small-sized head in high accuracy inspection is possible. Allows close mounting in narrow spaces, thus carefully detecting the height differences of miniature built-in watch components. New ZS Laser Displacement Sensor is using CMOS technology with glass mode function. Hence measuring glass height, thickness or gap is possible with high accuracy. Wide-line-beam of 30mm width detects any distortion in rails with the use of multi-point measurement with calculation functions. Outer diameter of metal pipes can be precisely checked by using calculation functions. Continuous monitoring of drive belt thickness by parallel beam laser displacement sensor. Compact sensor can be installed in limited space. Surface evenness inspection of brake pads is possible by measuring its height at a few points. When precision positioning of robot hand is necessary, small beam spot laser displacement smart sensor is recommended. High-speed inspection of height and wobble is possible, even though on object with shiny surface. The line beam of the through-beam laser sensor stably detects the edges and meandering of clear packing film. ZX-L-N sensor is small size, it can detect tiny condensers with high performance and stable. With an ultra-small spot beam of 50µm diameter, detection of small items like connector pins can be done precisely irregardless of color and influence from background. Surface flatness inspection of battery cap is possible by measuring heights at few points. The linear proximity model stringently detects inner aluminum foil locations that are not visible from the surface of the capacitors. The parallelism at the orientation flat position is inspected by locating two Laser Smart Sensor Units with the Operation Unit so that the distance difference between the Sensor Units on the left- and right-hand sides will be zero. The 2D CMOS laser adopted precisely measures curvature / warping of transparent plastic substrates. Multiple measurements can be made within the line beam, so the peaks of rivets can be measured from a reference surface with good stability. The 2D CMOS Laser stably detects angled connector pins. The small spot achieves stringent inspection of very small gears used for watches. Inspection of the floating and inclination of chips on trays is possible. Each tray is measured once, which reduces inspection time. Double glossy metal plates (e.g. lead frames) inserted together are detected by the signals of two sensors that are installed above and below the workpieces. High-accuracy measurement of sudden change of work is possible. By using an end plate and detecting from the side of the tube, detection is possible without being affected by paper splinters. Using two Sensors, the changes in thickness can be measured with high stability, without being affected by fluctuations in the conveyor belt. The gap between the dial plate and indicator needle of the pressure meter can be measured through the transparent glass cover. The number of sheets in a stack can be counted by detecting the level difference resulting from a single sheet. Bundles of cards, such as prepaid telephone cards, can be counted by detecting the card edges. Crumpling can be detected by measuring the distance to the top of the corrugations in the inner layer of cardboard sheets as they move on a belt. The arrival of the rubber material is confirmed so that it can be cut to fixed dimensions. The spray angle of a substance can be measured by detecting the amount of light that it blocks and the total time of the blocking. These Sensors enable the distance between metal rollers to be measured. The amount of adhesive being dispensed can be monitored by detecting the amount of light blocked by the adhesive as it leaves the nozzle. The compact size makes it possible for these Sensors to be mounted on welding machines in small spaces. The ZX-L-N can detect the strands of frayed edges during the weaving process in safety belt production. The ultra-small spot of the ZX Series enables counting by precisely detecting the grooves between the staples. The application of adhesive is detected by using two sensors to measure the thickness of the bag. The ZX-L-N Smart Sensor inspects the size of confectionery with a precision of ±1mm. Because the color of the objects being inspected is not consistent, a reflective photoelectric sensor cannot provide stable inspection. The judgment output of the amplifier can be used to determine the number of cap inner linings. A check can be made for caps that are not straight by comparing the height of a cap left-to-right. The height and inclination of a cap can be determined by measuring and comparing two points. The 2- to 3-mm hollow on the bottom of bottles can be used for positioning and other operations. Stable detection is possible without being affected by the color of the lid, using ZX-L-N Smart Laser Sensor. Differences in the depression of the film on the top of the container can be used to detect pinholes. Small surface variations can be averaged out to enable stable detection via ZX-L-N Smart Laser Sensor. The ZX-T has the ability to measure many small or thin components simultaneously. The peak height of a board can be measured by using the Self Peak Mode. The diameter of each capacitor is used to determine its type. The ZX-L-N even detects transparent objects and glossy wafers. Since high-speed and stable detection of transparent glass is possible, total inline inspections can be actualized. Furthermore automation of data acquisition is also possible with smart monitor ZERO. With a long sensing distance of 100 mm, small position gap of the press work can be precisely detected. High-speed detection of more than one text string is possible with one Amplifier. Inspections for correct dates is possible while inspecting for light, chipped, or disarrayed characters. Flexibly handles changes in text that occur on production sites. Increases production efficiency by eliminating false negatives. Smart Sensor with Ultra-high-speed Color CCD Camera can detect the presence of coating liquids that are not detectable by a Photoelectric Sensor. Smart Sensor distinguishes surfaces rather than points, therefore it is able to determine whether the amount of coating is excessive or insufficient. Smart Sensor with Ultra-High-Speed Color CCD Camera stably detects blurred printed character on cardboard.Adopting automatic color filter, it provides stable detection by allowing the Sensor to process images, even for the mark with low contrast. Smart Sensor with Ultra-High-Speed Color CCD Camera detects the presence of button cells after packaging.Pattern matching of the button cell and the background is used to eliminate the effects of the film's surface gloss and enable stable detection. The real-time search function enables high-speed processing for use on high-speed lines. Real color sensing technology enables stable detection of subtle soiling and foreign matter of any color. Caps are distinguished by color area, so differentiation is not affected even if the caps are turned or somewhat out of position. Vision Sensor with real color sensing simultaneously detects coating defects and double coating on molded products. Real color sensing technology enables subtle hue inspection with good stability similar to that of the human eye. Vision Sensor that integrates a smart sensor and LCD display detects the number of connector pins. The camera with built-in illumination greatly reduces installation work. Stable detection is achieved with edge measurements of transparent embossing tape moving at high speed. The detection area is treated as a plane to simplify tape position detection. The condition in which hot-melt adhesive is present is registered in the Vision Sensor to enable accurately detecting the presence or absence of hot-melt adhesive. The patterned parts of the sticker are registered, and the sticker is determined to be present or not by detecting whether the registered patterns are in the field of view of the 2D Sensor. Even chipping and crack defects of minute chip capacitor that shows only a small difference in contrast can be detected via Real Color Vision Sensor with high stability. Because the Sensor measures the area of predetermined colors, detection is possible even if the position of the flavor packet changes. By installing the Sensor Head at a slight angle, the threads shine white. This allows detection by comparing the area of the white part. When there is not enough space to install sensors above and below, an Ultra-High-Speed Color CCD Camera can be installed at the side to detect misalignment with high precision. Smart Sensor with High-Speed Color CCD Camera inspects liquid level edges.Because it is capable of detecting the liquid surface as an area, stable detection is possible in spite of workpiece movement or slight movements in the surface of the liquid. Check for the registered shape in the measurement area by teaching a part of the component. Identification of the front or back side as the reflected light at the edge with shear drop is smaller. Check for misalignment of packaging wrap label in the vertical position by checking the edge position. Identification of different inserts or differences in orientation by registering some of the characters/patterns on the package insert. Detection of printing characters on the product by recognizing the shape. Check for missing or misaligned labels by connecting to the amplifier extracting color of the seal and detecting the position. The Vision Sensor achieves stringent inspection of black liquid, which is difficult to optically inspect, provided that inspection from the side is possible. Even subtle differences in images are stably detected with a Sensitive Search. Detection of the fluid level by teaching the fluid surface as the edge position. Edge measurements enable stable counting. More than one area can be counted simultaneously. Detection using the average brightness valve by teaching using the OK area. Measuring part of an electronic component's shape or patterns enables determining the orientation of electronic components and detecting incorrect models. Identification of OK/NG by registering the OK article and using it as a basis (number of pins). Identification of OK/NG by checking lead wire width, using the OK lead width during teaching as a basis. Detection of solder by teaching the conforming soldering state (solder area). Detection of the notch shape by teaching using the notch. These sensors compare the object being inspected with a registered pattern, enabling detection of solid-color (plain) objects. The boxes are sorted by distinguishing printed grade markings. Chips, burrs or light-colored dirt can be detected on curved or tapered components. The edges of measured objects captured by camera are detected to inspect the shape. Target patterns can be quickly and easily registered to inspect marks and positioning, or to prevent the inclusion of incorrect product types. Accurately inspect printed character conditions by checking the readout and expiry date shown on packaging. The ZFV Smart Sensors are able to determine when characters are missing in printed dates. Character defects and other defects such as dirts can also be detected with Machine Vision Sensor. The positions of liquid crystal reference marks can be measured using two cameras to determine the overall position. Stable measurement is achieved at low cost for moving objects. The position and orientation of workpieces can be confirmed to enable accurate grasping with a robot arm and packing into cases. Inspection is possible for mold defects, missing terminals and other chip capacitor defects. The number and bending condition of leads are inspected. IC model numbers, lot numbers, and other information can be read and checked. Color type vision sensors are used to identify colors of relays in fuse box manufacturing lines. Vision sensors are used to identify the presence or absence of parts for defects during semiconductor transfer lines. This application uses a Fiber Sensor with a homogenous area beam. You can detect lifting and inclination of chips placed on trays. A change in the amount of interrupted light caused by the inclination of components enables detection. This system uses special optical components to detect the same size of workpieces anywhere in the 11-mm-wide detection area. This Fiber Sensor with differentiation controls the edges of transparent sheets that are wound with a roller. E3Z Sensor with light-intensity switching function achieves preventive maintenance by periodically performing a sensor test. If the Sensor fails to operate when the incident level is switched to 1/2, it is determined that the operating margin is too small and maintenance is required. Amplifier with a differentiation function and wide-area detection area head detects falling products stably.Differential operation makes it possible to detect workpieces by ignoring changes in light intensity over time. This Digital Photoelectric Sensor with ATC detects non-woven textiles in an area filled with airborne paper dust. ATC automatically corrects the threshold of the Sensor to match changes in the light intensity caused by dirt. This application uses a Laser Sensor with a Built-in Amplifier and a long detection distance. ?This Laser Photoelectric Sensor has a long detection distance and is ideal for drills in environments with sprayed oil mist. The Fluororesin Photoelectric Sensor with a compact built-in amplifier ensures detection in places where oil or chemicals are sprayed. The stainless-steel housing is ideal for use in the food processing industry, because it has excellent corrosion resistance to detergents and disinfectants. With IP69K degree of protection, it is able to withstand high-temperature, high-pressure water. Optimum for Food Industry that requires high level of hygiene. The E32-T61 features a temperature-resistant fiber for stable wafer detection at high temperature of 300°C or higher. This application uses a Laser-type Photoelectric Sensor with a Built-in Amplifier. ?The E3Z Laser Photoelectric Sensor with a 60-m sensing distance detects protrusion of large cargo. This application uses a Spot-type Photoelectric Sensor with Separate Amplifier. ?You can remotely detect the presence of minute amounts of silver paste on lead frames. This application uses a Thin-beam Fiber Sensor. ?You can achieve a stable pin detection with this Thin-beam Fiber Sensor. The small built-in lens generates a thin beam. This application uses a Fiber Sensor. Install this Diffuse-reflective Fiber Sensor at the glass window on the side of a tank to detect the presence of liquid. This application uses a Spot-type Laser Photoelectric Sensor. ?This Spot-type Laser Sensor detects minute positioning of infusion bag caps. This Small Spot Fiber Sensor detects shortage of adhesives during adhesive application. This application uses a Line-beam Laser Photoelectric Sensor. 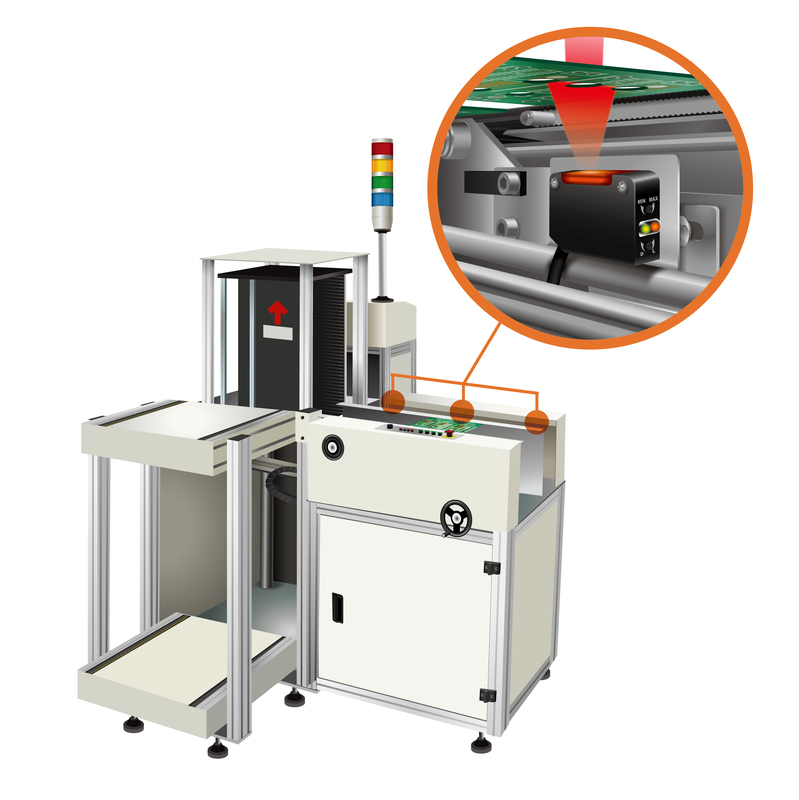 ?This Line-beam Photoelectric Sensor detects raised or misaligned shrink-wrap film. The E3G-R13 (retroreflective model), with a rated sensing distance of 10 m, enables long-distance detection of cars in multi-storey parking lots. This application uses a thin Convergent-reflective Fiber Sensor with a long-distance detection. The two fiber heads embedded into the robot hand and a single amplifier achieve stable detection of the position of transparent LCD substrates. This application uses a Spot-type Laser Photoelectric Sensor to detect minute objects. The minute spot laser beam with maximum diameter of 1 mm accurately detects small-diameter pins, at a sensing distance as long as 1 m.
This application uses an area-detecting Fiber Unit to detect passage of minute chips that may drop in various different positions. The passing of chip components is detected even if the passage location varies within a width of 11 mm, regardless of whether they are metallic or non-metallic. This application uses a Line-beam Laser Photoelectric Sensor to inspect mark or gap on various sheets. ?This Line-beam Laser Photoelectric Sensor is ideal for printed areas. A single E3MC unit with four outputs detects the differences of up to four colors. This application uses a Twin-output Fiber Sensor. This Reflective Fiber Sensor detects the color difference of two types of candies or cookies. This Fiber Sensor with a Long-distance Lens enables detecting changes in the height caused by double pallets for canned beers being inserted together. Powerful beam reduces influence of dust and dirt. Long sensing distance enables use in large-scale installations. A small spot with a sensing distance as long as 1 m stably detect adhesives or sealing materials. Greatly enhanced beam visibility for easier optical axis adjustment of sensors. The optical design maximizes the linear propagation of laser beams. Red laser beams (class 1) can be precisely aligned on the targeted position. The through-beam sensing distance of 60 m provides sufficient allowance, enabling Through-beam Models to be used with reliability even in dusty environments. With Through-beam Models, an emission interruption function is also available by request. This function is ideal for preventive maintenance applications. With its super-sharp beam spot of 2 mm diameter, precise detection of strip material can be attained. Position of sheet can be controlled using digital amplifier with analog output of 1-5V. With analog offset value function, any reference can be set. With a rated sensing distance as long as 30 m and an IP67G enclosure rating, the E3S-CT11 Metal Case Sensor enables long-distance detection of broken drills in places where oil is sprayed. The area beam detects the amount of grease applied to sliding components. With a maximum spot diameter of 4mm, minute height differences can be differentiated and CDs can be precisely detected. By arranging four 30-mm-wide Area-detecting Fiber Units and using a differential function, scratches in a 120-mm-wide sheet can be precisely detected. Stable detection is possible with laser point beam. A black/white error as low as 5% makes detection and operation more stable. Using through-beam fiber unit, the object can be detected stably, reducing the number of overlapped sheets. With analog output, subtle differences in color can be recognized. Mark detection in dusty environment is possible using E3X-DAAT-S threshold compensating digital amplifier sensor, which counteracts dusty environment with the use of a reflective fiber head. Precisely eliminate background influences. Differential travel of 2% maximum is the best in its class. The E32-T11L features a high-power, long-distance fiber for stable detection of parts inside (translucent) containers. Retro-reflective fiber unit detects and counts the number of translucent capsules. With the use of external input amplifier model, counting can be done. This application uses a UV power monitor that allows you to monitor the amount of light from a UV lamp. This Sensor detects the degradation and output conditions of UV lamps used for UV sterilization in food production lines. It keeps the amount of light of UV lamps constant to enable quality control of hardening conditions. Sheet markings or sheet shifting is detected with a variety of beam shapes. If the pipe is transparent with comparatively a small diameter and inspection from the side is possible, the liquid in the pipe can be detected by light refraction. In that case, the E39-F1 Long-distance Lens Unit is mounted to the emitter only, and high power is obtained by stopping down the beam. With laser point beam, small displacement can be detected. Stable detection is possible with no influence from a glossy background frame. The spot diameter for BGS models is 0.5 mm (typical example at 300 mm). Combined with an hysteresis of only 5%, even minute differences can be detected. Models with a response time of 0.5 ms (E3Z-LL3/8) are available as standard models for fast-moving objects. Long sensing distance of 300 mm (white paper) allows flexibility in positioning Sensors. With thin fiber head, small gap of 25µm can be detected when light passes through. Use together with amplifier E3X-DA-S, sensing distance of 50 mm can be attained. Using differential operation mode, any knots in wire/threads can be detected reliably. Laser beam is constant at 2mm diameter, up to 1 m. Optical axis can be adjusted. Detection of thin connector pins are possible with long sensing distance. Fluoroplastic-coated, long-distance fiber unit is ideal for applications requiring resistance to chemicals. This ultra-compact, thin-sleeve fiber unit enables reliable alignment inspection of small objects, such as electronic components. The reflective model stably detects a variety of glass substrates including wobbling substrates and those with various edge-processing conditions. This application uses a UV power monitor that allows you to monitor the amount of light from a UV lamp. This Sensor detects the degradation and output of UV lamps used for drying and cleaning of LCD glass. It keeps the amount of light of UV lamps constant to enable quality control of hardening conditions. This application uses a UV power monitor that allows you to monitor the amount of light from a UV lamp. This Sensor accurately detects the degradation and output of UV lamps used for hardening high-precision resin components. It keeps the amount of light of UV lamps constant to enable quality control of hardening conditions. This application uses a UV power monitor that allows you to monitor the amount of light from a UV lamp.? This Sensor not only detects the degradation of UV lamps used for bonding LCD substrates, but also detects LCD glass, which is usually difficult to detect. The system keeps the amount of light of UV lamps constant to enable quality control of the hardening conditions. "This application uses a Side-view Fiber Sensor with a homogenous area beam. ?This Sensor uses a change in the amount of interrupted lights caused by notches and eccentricity to enable detecting the position of notches and eccentricity of wafers. The amount of interrupted light by wafers is proportional in the 11-mm-wide detection area. The special optical components enable homogenous area beams in the detection area." This application uses a Photoelectric Sensor to detect transparent objects, including glass wafers or transparent glasses. ?Through a view port, this Sensor can detect glass wafers that travel in a vacuum chamber. We used optical and circuit technology that detect minute signal differences of transparent glass. This application uses a Vacuum Fiber Sensor that can be used under a high vacuum. ?This Sensor can be used under a 10-5Pa vacuum. The Sensor has 1-channel and 4-channel flange system that you can combine according to the number of Sensors. This application uses a Through-beam Fiber Sensor that is heat-resistant to 200°C.Install heat-resistant Through-beam Fiber Sensor with a convergent-reflective arrangement. This setting is hardly affected by the background, which enables precisely detecting the presence of LCD substrates. The E32-T17L, with a rated sensing distance of 20 m, enables precise long distance detection of automobiles during automotive coating process. The fiber sensor with an added lens unit achieves a small spot beam with a variable diameter ranging from 0.1 to 0.6 mm. "This application uses a space-saving Flat View Fiber Sensors to detect presence of minute components and precisely inspect their front and back surfaces. You can connect two Fiber Sensors with a two-channel Fiber Amplifier, thus saving both energy and space." This Color-sensing Digital Fiber Sensor is used to detect registration marks. It achieves more-stable detection than a conventional sensor, which judges with the amount of reflected light against positional fluctuations in the workpieces in the production process. This application uses a Pipe-mounting Liquid Level Photomicrosensor with built-in amplifier that achieves detection through pipes. This Sensor uses difference in the refractive index between liquid and air in pipes to enable detecting the presence of liquid in the pipes. The extra-narrow beam detects, and counts, the cup edges. The red transparent ball in a gas flow meters can be detected with high stability by the Blue LED Digital Fiber Amplifier. The direction of crane movement can be distinguished, and the crane's entry into danger zones can be detected. A diffuse reflective sensor can be used to detect cardboard boxes from a distance of up to 1 m. A retro reflective sensor enables detection from up to 4 m. The use of the Cover Bracket provides even greater durability. These sensors are minimally affected by backgrounds, enabling them to accurately detect black objects, such as tires, at a distance. The 200°C heat resistance of these Sensors enables use with extremely high-temperature liquids. The process of determining the front and back side of nuts as they leave a parts feeder can be automated. The regular reflections of the glossy front surface are deflected away, while the diffuse reflections of the back surface are detected. The E32-D33 Thin Head Fiber Unit is able to determine whether threads have been cut into aluminum die cast workpieces. Because the light strikes at an angle, even extremely small threads can be accurately detected. This narrow beam enables detection as far as 200 mm away, through an opening as small as 1 mm. Because teaching without a workpiece is possible for the E3X-DA-S, the sensitivity for detecting weld locations can be set without having to stop the workpiece. The E32-D12F can detect light reflected from oil drops. The Fluororesin-coated fiber can also be safely used in an environment where oil is likely to be spattered. The diffuse reflections of poorly polished surfaces make it possible to detect the difference between them and properly polished surfaces. The use of Fluororesin makes these Sensors ideal for the applications with a wide variety of oils. The E3Z-T61, with a rated sensing distance of 15m, enables precise long-distance detection of engine blocks. The small 2-mm-diameter spot can detect even minute amount of adhesive or grease applied to precision components. E32-T16W Area-detecting Fiber Unit inspects tape remaining in tape take-up application. This application uses an Area-sensing Fiber Sensor. ? This Area-sensing Fiber Sensor eliminates the effect of the detected position of workpieces. The perforations between desiccant packets are detected by the E32-T22S Narrow-view Fiber Unit. Stable detection of individually wrapped candy is possible without being affected by the color, tilt, or glossiness of the candy. The E3MC RGB Color Sensors distinguish colors by detecting differences between them and registered reference colors. Stability can be further enhanced by placing a white panel in the background. The difference in glossiness is used to detect sealing tape without being affected by the colors of patterns on the box. Powdered chemicals passing within a specific area can be detected, and adjustment can be made by teaching. Teaching can be done without a workpiece. The difference in glossiness is used to differentiate between the ampoules and the dividers between them, to ensure that only the ampoules are counted. The angle of objects can be aligned properly during packing by detecting minute color differences and marks. Being able to differentiate between the tray separators and the tray bottoms enables stable detection of noodles without chattering. Water resistance of IP67 is provided to application in water rinse process in the food industry. Wrinkles in package materials can be detected. As shown below, light diffused by wrinkles in the package is received if the emitter and receiver are installed at an angle to each other. The E3X-DA-S Long-distance Sensor enables inspection on content of opaque packaging materials. A powerful light beam of E3Z Photoelectric Sensor can penetrate paper boxes to detect the contents. Detection of food such as candies or biscuits is even possible from overhead. Sensitivity adjustment is not required even if the color of the product changes. A retroreflective sensor that saves both space and wiring can achieve stable detection of transparent PET bottles with gaps between the bottles as small as 5 mm. Even clear labels at close intervals on support paper can be positioned without contact. Detection is possible with a through-beam fiber sensor if the backing material is translucent. The light beam is interrupted when there is a label and received when there is no label. Differences in mark density can be used to enable detection using an infrared light source and through-beam sensor. Differences in gloss can be used to detect coatings. Stable detection is possible even for clear shrink tubes. E3MC Color Sensor (LED Type) detects misaligned candy wrapper tapes. Stable PCB detection is possible because the large spot is not affected by the color, or holes and notches on the board. The EE-SX77/87 features a compact size with a thickness of only 4.6 mm. They can be mounted densely in very limited spaces. Adding a Lens Unit to a fiber sensor enables detection of very small workpieces at a detection distance of 17 mm with a 0.2-mm-diameter spot. The E32-DC200F detects reflected light from internal threads to check for missing components inside. When inspecting two levels of connector pins with an ordinary fiber unit, the lower set of connector pins caused an ON signal even when the upper level is missing. The E32-L25L Convergent Reflective Fiber Unit, however, is able to detect upper and lower sets separately. The length of lead wires of electronic components can be confirmed. E3T Miniature Photoelectric Sensor with Built-in Amplifier detects full IC sticks. Easy detection, even in tight spaces, is possible with no sleeve bending. Three sensors are used to simultaneously detect defects (bent, missing etc.) of IC pins. The E3T is capable of detecting objects as small as 0.15 mm. Detection remains stable, with minimal effect from backgrounds or surrounding metals. The resin tablets for different IC types with different length can be distinguished by the amplifier's monitor output. Chips are detected in an area of 11 mm. IDE-view configuration of E32 Side-view Fiber Sensor allows use in spaces that are too small to mount ordinary through-beam sensors. Highly effective for space-saving installation. The ultra-small spot with a 2-mm diameter detects even minute amounts of silver paste on lead frames. An allowable bending radius of 4mm enables the E32-D11/D21 to withstand repeated bending, making it ideally applicable to moving parts subject to frequent bending. The Fiber Unit uses Fluororesin so that chemical levels can be precisely and directly detected in cleaning tanks or chemical processing tanks. A minimum level difference of 4 mm can be detected in stages to control resist liquid levels. High-precision detection is possible using a narrow-view beam. Mounting a Slit and Adjustment Unit enable restricting the light for stable detection even when there is inconsistency in the cassette resin or individual units. The mounting of wafer carriers can be confirmed. This slim sensor is only 3.5mm thick so that it can be mounted in small gaps and spaces. The narrow beam enables detecting single wafers, even wafers with mirror surfaces. An L-shaped side-view sensor that requires little space and provides 200°C heat resistance is used. The detection distance of 1,300 mm (for E3X-DA-N Standard Mode) is more than sufficient to detect even large glass plates. This application uses a Retroreflective Sensor with long detection distance. ?This Sensor remotely detects the presence of glass substrates with a sensing distance of 7 m. Mounting a Beam Unit enables the use of line and area beams. The spot diameter for Through-beam and Retro-reflective Models is 5 mm (a typical example at 3 m), making it possible to detect small workpieces at long distances. The sensing distance for Retro-reflective Models is 15 m (when an E39-R1 Reflector is used). This is the longest leeway in the industry. The maximum ambient operating temperature is 55° with an IP67 degree of protection, allowing the Sensor to be used in severe operating environments. The extra-narrow beam precisely detects minute bad marks. No pipe dimensional restrictions. Incorporates a Fluororesin-coated sensor that is not strongly influenced by foam or water drops. BJP series photoelectric sensors are used in PCB magazine loaders for stable detection of PCB boards regardless of holes, protrusions, or intrusions on the boards. Push button type photomicro sensors are used to detect presence of semiconductor wafers. The SUS316L body withstands cleaning agents at temperatures up to 120°C and features high resistance to corrosion, allowing direct installation onto lines that require cleaning. Mold mating detection using heat-resistant Digital Proximity Sensor. Inspection of mating of models in molding machines is possible at temperature as high as 200°C. The capacitive model ensures detection of not only silicon wafers but also glass wafers. The distance between the aluminum foil package of medicines and the sensor varies depending on whether the instruction sheet is included or not. The Proximity Sensor precisely detects the instruction sheet, which is not visible from the outside. Material and height screening using E2C-EDA High-Resolution Digital Proximity Sensor (Separate Amplifier Type). Inspect the gap between presses with E2C-EDA High-Resolution Digital Proximity Sensor (Separate Amplifier Type). Inspect the screw assembly by measuring the height of the screw. This resin case model photoelectric sensor ensures stable detection of bottle caps in humid environment. Inspects capacitor sleeve mounting with E2C-EDA High-Resolution Digital Proximity Sensor (Separate Amplifier Type). The Capacitive Proximity Sensor detects the milk in opaque paper cartons. These Proximity Sensors can be mounted on moving objects, such as robot arms for chucking applications. These Sensors are designed for use in places subject to spattering. Dies in molding machines can be checked to ensure close contact even in temperature of 200°C. 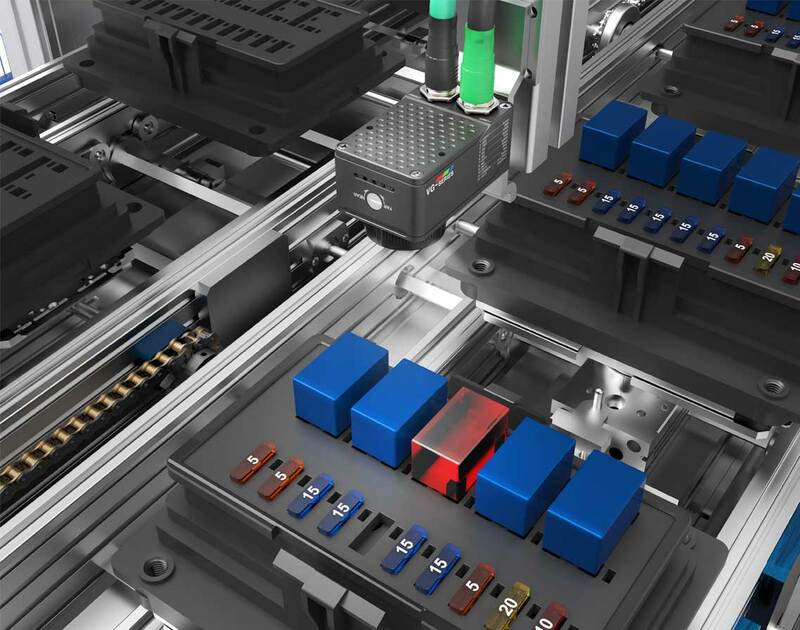 The slot-type head configuration of these Aluminum-detecting Proximity Sensors can be mounted in small spaces for use in confirming the seating of workpieces. A response frequency of 1kHz makes the E2S well suited to high-speed machine and device applications. A special sensor for aluminum is used to detect any missing caps. Compact, flat sensor head can be mounted in small spaces for detecting non-ferrous metals, such as copper and aluminum. Teaching function of E2C-EDA Digital Proximity Sensor enables ferrous metal detection at the optimal distance. This space-saving sensor used under dry environments stably detects the bottoms of glass substrates while they are transferred on a conveyor. Sensitivity adjustment can prevent detection errors previously caused by foam in cleaning tanks containing soap. Application in corrosive liquids is also possible by using a Fluororesin-coated Sensor. Using ultrasound enables stable detection that is not affected by the color of the bottles. The Picking Sensor ensures precise confirmation of component extraction with no mistakes. The Ultrasonic Displacement Sensor stably detects all types of liquid to meet stringent inspection requirements, provided that inspection from the upper side of the tank is possible. Accurate detection of liquid surfaces at long distances is enabled by using the E4PA-N Reflective Ultrasonic Displacement Sensor with a sensing distance of 6 m.
The Area Sensor for workpiece detection precisely detects food trays of a wide variety of heights or types within the sensing area. This application uses a Digital Pressure Sensor with LED display that controls the main pressure of air presses. By using ultrasonic wave, even though workpiece is transparent or with color pattern, detection with stability is not affected. The outline form and type of a painted object can be inspected by locating four F3ZN Area Scanners around the workpiece and measuring its height and width according to the number of optical beams blocked. The Pressure-difference Flowmeter of compact mono-block construction with a digital indicator monitors the air flow rate in real-time. Ultrasonic detection stably detects thin, clear film that is not detectable with photoelectric sensors. The Minute Pressure Sensor of mono-block construction with digital display is used to check the normal output of nitrogen gas. Even in a dusty environment, 1-m² sand molds can be detected diagonally from a distance. Connect up to four miniature sensors to one 4-channel Controller to enable the pressure management capacity of four controllers at one location. To control the baking condition of conveyor-transported bread by monitoring the time that it spends passing through the oven, the speed of the conveyor belt is detected by the Rotary Encoder, and the result is converted to passage time and displayed by the Frequency/Rate Meter. The Ultrasonic Displacement Sensor achieves stable positioning of transparent LCD substrates from a considerable distance. Minute pressure differences are used to monitor nitrogen gas flow. Wafer positioning and high-speed detection using E6L Easy Scale Linear Encoder. This sturdy rotary encoder enables positioning at a consistent cutting pitch when cutting silicon wafers. 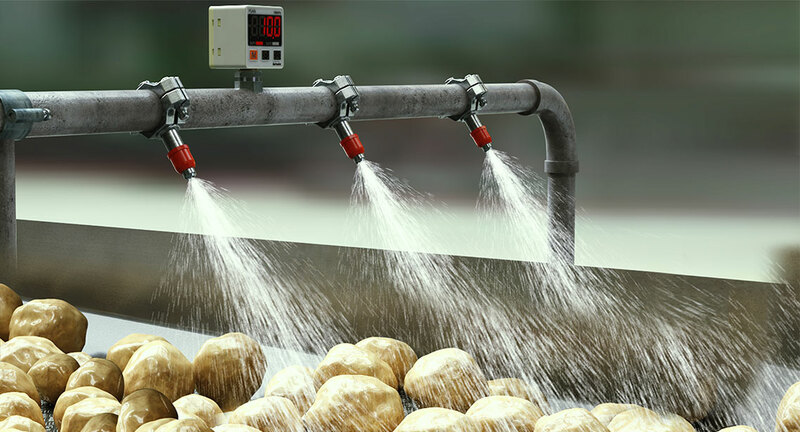 Digital pressure sensors are used to measure the pressure of water sprays in potato washing conveyors. Dual display pressure sensors used to detect suction status semiconductor parts during semiconductor manufacturing process. Problems: Rental management of large equipment like construction equipment is often done by hand using a control ledger, but this results in considerable added work, such as entering the paper-based data into a personal computer for management. A more efficient and accurate system is desired. Because rental equipment is generally stored outdoors, it is necessary to use metal labels for bar code control, which raises costs. Use screws to mount an ID Tag directly to the construction equipment, and write the vehicle data and control number onto the ID Tag in advance. Each time the equipment is rented, add the customer data and rental period information to the ID Tag, and send this data to the control host. Install Antennas at the entrance/exit gates, then read the ID Tag data when a truck transporting the construction equipment passes through the gate, and send that information to the host for use in controlling all equipment that leaves the site. When the rental equipment is returned, read out the data from the ID Tag that is attached to the equipment as it passes through the gate, and simultaneously retrieve the rental information from the control host software. * The antenna conforms to IP62, and should be housed in a waterproof box. Consult your OMRON representative concerning the location for installing the Antenna when using a microwave-type RFID, because the signal sometimes reflects off of metal, or interferes with wireless LAN systems. Problems: Selecting, sorting, or delivering fruit using mechanical flags (for variety discrimination) on special pallets gives rise to complicated mechanical parts with frequent malfunctions. Creating new mechanical flags to deal with new varieties uses up time and money. Water and dirt can cause reading errors in bar code systems. Store information obtained by a sorting machine, such as size, grade, and sugar content, in the Data Carriers (ID Tags) mounted to the pallets. Position Intelligent Flags at the sorting stations, read the information from the Data Carriers, and sort the fruit according to size, grade, or sugar content. Problems: Warehouse inventory control of rental machinery is complicated because it involves many different items. For example, it is necessary to keep track of which machinery has been rented out, which machinery has been returned, and what condition the machinery is in (e.g., how clean it is). Clerical errors can occur in management systems based on hand-written forms. Collating all the information into, for example, daily or monthly reports can be very difficult. Perform inventory control using ID Tags mounted to the machinery. Write information about the machinery, such as the machinery number and the status of the machinery (e.g., reserved/available, processed/not processed after return, clean/dirty), to the ID Tag. Problems: A company wants to automate the control of tramcars that are used to transport machinery and materials for tunnel construction and other works, in order to increase worker safety and improve the work environment. It is difficult to determine the present location and destination of the tramcars using a control system of only wireless devices and sensors. Mount an Antenna to the tramcar, and connect it to the equipment for controlling the tramcar operation (programmable controller, wireless device, etc.). Position an ID Tag at each point along the track where control is required. Write the basic position information into each ID Tag. The tramcar can then run automatically (stop, slow down, branch, etc.) according to instructions issued from above ground by wireless communications, while reading the data in the ID Tags. Problems: Because the contractors entering and leaving through company gates tend to be concentrated in certain times of the day, the gates become crowded and distribution efficiency drops. This also causes traffic jams in the surrounding roads which inconveniences the local community. An entry/exit control system is necessary that will maintain high levels of security with regard to regular contractors while also increasing efficiency. Install an Antenna at the gates to read data (contractor's name, driver's name, truck number) from ID Tags held by the drivers, and write that data and the entry/exit time to a database. The driver does not need to leave the truck to do this. He can simply face the ID Tag in the direction of the Antenna to pass through the gate. By comparing the times read from the ID Tag when passing through the entry and exit gates, the peak traffic times inside the company grounds can be determined. Problems: Products on pallets are transported by forklift both inside and outside the warehouse, but it is necessary to have better control over forklifts entering and leaving the warehouse for product-liability reasons. Instructions to tell the forklift drivers which warehouse number to go to are generally given either in the form of job sheets or by wireless communications. Sometimes, however, drivers end up going to the wrong warehouse due to human error. A better system is needed. Place an ID Tag on the roof of the forklift (secure with a magnet if necessary). Then install one Antenna each at the entrance and exit of the warehouses. (For the most accurate control, these should ideally be designated as one-way routes. This point must be covered by control measures.) Store the number of the forklift and, if necessary, the name of the driver, in the ID Tag. The Antennas will then read the data from the ID Tag each time the forklift enters and leaves the warehouse, and send it to the host system. A system can also be built so that an alarm is sent to the forklift driver if he tries to enter the wrong warehouse. For additional control, the time that the forklift passes each Antenna can be written to the ID Tag. That data can later be uploaded to a database to show the operational flow of the forklifts. Problems: Motion control for high-speed conveyors, such as OHTs and sorters, can be performed with mechanical flags that use photoelectric sensors and optical communications devices. With systems based on mechanical flags, however, position displacement caused by shocks and vibration can result in malfunctions. Wear-and-tear can lead to problems related to light-source deterioration, and malfunctions due to dirt can occur. In order to develop a faster system, a greater level of autonomy is needed. RFID technology would give the required level of autonomy but, generally speaking, the communications speed would be too slow. Mount ID Tags to the OHTs and install Antennas at stations and junctions as required. Store OHT unit numbers and other relevant information in the ID Tags. When an OHT reaches a station, read the unit number with the Antenna, and send the OHT to the specified location by switching points as necessary via the control system (e.g., PLC) connected to the Antenna. Problems: There are AGVs (Automatic Guided Vehicles) and RGVs (Rail Guided Vehicles) that run while sensing magnetic tape attached to the floor. They must stop at stations to load or unload cargo, and control is required to ensure that they proceed in the correct direction at junctions. This kind of control can be performed with wireless devices and sensors but depending on the installation, positioning, and environmental conditions, the sensors used may not have sufficient detection accuracy. A way of allowing the system to be changed more simply is needed. Embed Data Carriers (ID Tags) in the stations and at junctions. Incorporate an Intelligent Flag in each vehicle and connect it to the PLC or (Control Board) already built into the vehicle to control vehicle motion. Write the station number or junction number in the Data Carriers as bit data (e.g., 00000001 for station 1 and 00000010 for station 2). Either program control information (e.g., stop, decelerate) for each station in the PLCs, or send control information to the PLCs when required using a wireless device. Motion control of the AGVs will be based on the data read by the Intelligent Flags. Problem: Human error problems occur because operators are making line changes as they look at paper-based instructions. Store the work instructions (model information, welding instructions, programs, etc.) into the ID Tag, and mount it to the carriage. The work instruction data inside the ID Tag can be read by a non-contact reader to help automate the process. Problem: Human error problems occur because operators are making line changes as they look at paper-based instructions. Bar codes were previously used, but errors occurred in reading. Store the work instructions (model information, welding instructions, programs, etc.) into the ID Tag, and mount it to the carriage. The work instruction data inside the ID Tag can be read by a non-contact reader to help automate the process. Problem: The efficiency of the present, paper-based system of inspection instructions is extremely poor because the operator has to step out of the vehicle at each step to make the settings. Since the inspection results are entered by hand, human error is likely and the process requires considerable time. Automate the setting process with non-contact reading of the inspection instructions (such as vehicle model data and inspection data) stored in ID Tags. Eliminate manual entry by writing the inspection results directly into the ID Tag in the inspection process. Problem: Managing tools for machining centers, lathes, and hobbing machines on paper, by storage location, or by writing directly on the tools with a marker pen leads to delays and processing errors due to incorrect setting. Associating the information required for tool management (e.g., usage time and tool length) with the actual tools is difficult. Process the pull-stud or drive-key groove of each tool so that an ID Tag (dimensions: 8 dia. × 5 mm or 12 dia. × 5 mm) can be attached using adhesive, and store tool management information (e.g. tool number, name, usage time, and tool length) in the ID Tags. In addition, store information obtained by the tool presetter (e.g., initial tool length and compensation values) in the ID Tags. Problem: The manufacture and delivery of tires is carried out systematically based on a production plan. Urgent items, however, must be sorted by hand, giving rise to human error, such as destination direction, model discrimination, and quantity counting errors. The hangers vary with the size and type of tire and so conveyance efficiency is very low. Sorting is performed using bar codes on the tires but dirt on the label can lead to reading errors and it takes time to check the tires. When mounting a tire onto a hanger, write information regarding the tire type, the destination direction, and urgent-item flags to a Data Carrier (ID Tag) mounted to the hanger. Perform sorting (automatically) based on information regarding the tire type and destination direction read from the Data Carrier using a R/W Head (Antenna) mounted to the sorting point in the hanger conveyance system. Display information related to urgent-item flags on display devices. Problem: In engine assembly lines that use mechanical flags and bar codes for model discrimination and process instructions, the production line sometimes has to be stopped because of mechanical failures or other factors, such as not being able to read the bar codes because of oil or coolant. Although mixed production lines can be handled, increasing diversification of client needs has led to further increases in the number of different models, and switching between different types of operation must be performed with more efficiency and stability than ever before. Mount Data Carriers (ID Tags) to the pallets or jigs. Write model information and process information to the Data Carriers, read the information at each process station, and, based on this information, switch the operation type (if necessary) and perform processing. After completing a process, enable the processing completion flag for that process. Problem: When pouring is based on visual confirmation of a number plate mounted to the mold, the influence of dust, high temperatures, vibrations, or other conditions particular to the production site make work very difficult. The number plate is difficult to see because of dust, increasing the likelihood of human error. The versatility to switch between different types of operation and high work efficiency, essential for responding to a variety of needs, are difficult to attain. Store information about the mold number and pouring hole position in Data Carriers (ID Tags) mounted to the molds. Read the information from the Data Carriers on the molds with an Antenna mounted to the pouring machinery, and perform pouring work (automatically) based on this information. Problem: Components are inserted in a plating bath for metal plating. When multiple components are inserted, each of the individual components must be managed. Paper and labels are used for this purpose in other processes, but they cannot be used here because the components are inserted into the bath. Human errors and missing components can result because it is difficult to keep track of which components, from which lots, are in the plating process. In some cases, the plating conditions are determined prior to plating and written up into work instructions for manual input. Due to the short life cycles of products today, and the speed at which model revisions occur, this instruction system becomes quite rushed and subject to human error and other mistakes. An operating method with greater accuracy and efficiency is needed. Mount a Data Carrier (ID Tag) onto the plating basket (pallet) carrying the components. Write the component data, lot data, urgent-item flag data, and plating conditions onto the Data Carrier. Mount a R/W Head (Antenna) onto the controller of the plating device. Prior to placing the components into the bath, use the a R/W Head to read the lot data, product data, and plating conditions simultaneously, and automatically make the condition settings for the plating device. In order to achieve more advanced work process management, configure a system that writes the work start and end times for each plating job. This will enable process history and process progress control, making it easy to determine where components are in the process at any time. Problem: The components, dies, etc., that are needed for the processing and assembly lines of home appliances are conveyed in carrier boxes or totes. A paper list is placed in the boxes, and the parts are sorted while checking the list at each process. This system is inefficient and lends itself to human error. Many companies would like to improve on it without having to make a large investment. Bar code labels are attached to carrier boxes, and a bar code reader is used to read the labels at each sorting stage. However, when labels become soiled, they cannot be read or they cause reading errors. Or, to lessen the parts control burden on the host computer, companies have switched to a system that issues parts-distinguishing labels for each component instead of carrier box-distinguishing labels, but the cost of issuing the labels and the extra work of replacing them is driving up operating costs. Companies are therefore seeking to improve on this system. Mount Data Carriers (ID Tags) onto the carrier boxes carrying the components. Use a special holder that allows the Data Carrier to be easily mounted and removed for this. Write bit data to the Carrier Data for distinguishing components (for example, 00000000 for component A, 00000001 for component B, 00000010 for component C, and 00000011 for component D; up to 258 components can be distinguished with eight bits). Install a system with Intelligent Flags and a PLC at each process to automatically read the component bits and sort the components accordingly. Problem: Bar code labels or photoelectric mechanical flag seals are attached to the pallets of hanger conveyors that are used to transport small lots of CRTs or monitors for TVs and PCs in the processing and assembly lines. Because the hangers sway, the reading depth changes and the labels or seals sometimes cannot be read, causing the line to stop. The number of models being produced has increased due to diverse user needs and the appearance of LCD and plasma TVs. This has created the need for frequent line changes, and the resulting complex processes make control by a host computer extremely difficult. Mount a Data Carrier (ID Tag) onto the hanger pallet carrying the product. Write the data to distinguish models in bits (for example, 0000 for product A, 0001 for product B, and 0010 for product C, allowing 16 models to be distinguished with four bits). Install a system with Intelligent Flags and a PLC at each process. When the work at each process ends, write the process end flag data onto the Data Carrier. Use a ""1"" flag for ending, and a ""0"" flag for not ending (for example, for four processes, use 0001 for the end of process 1, 0011 for the end of process 2, and 0111 for the end of process 3. These will enable process progress management). Problem: Since the production processing and assembly time, as well as the holding time, for each process in the production line cannot be accurately obtained, it is impossible to determine where to start in making process improvements aimed at raising productivity. Obtaining the progress status for each process in the production line is an important factor in achieving supply chain management (SCM), but it is extremely difficult to control this on a host computer because the processes are split into several branches and then merged. Mount a Data Carrier (ID Tag) onto the pallet carrying the product, or onto a workpiece. In addition to product information, write the work start and end times as they occur for each process onto the Data Carrier. Then, at the final process, read the time data that was written for each process and create a graph containing the process history and corresponding time data to analyze the processes. When the work at each process ends, write the process end flag data and instructions for the next process onto the Data Carrier. Problem: When multiple automated lines are used for production, there is no simple way of standardizing and maximizing the production volume of each line. It is also difficult to determine the operating condition of each automated machine. In a production system where the work results and inspection results from the preceding process are used to determine which automated line the product will be sent to for the next process, control by the host computer is difficult, and errors are extremely troublesome to handle. Mount a Data Carrier (ID Tag) to each pallet, write the work data for the automated machine (automated machine number used, lot number, tool used, work program number, etc. ), and use this to send the product and components to an available line. The instructions are read by each automated machine, and the work is done. The work start time and end time are written to the Data Carrier. For inspection processes, the inspection results are written together with the automated line number that should be used next, and the subsequent work is done at that automated line. Problems: Food products demand a high degree of safety. The importance of managing a wide variety of information, such as the date and place of production, the best-before date, and the destination direction is greater than ever and has made quality control of foodstuffs very difficult. Food products cartons are cleaned with alcohol, detergent, warm water, or steam and so machines that have a low resistance to chemicals or high temperatures, or that may allow bacteria to proliferate cannot be used. Mount Data Carriers (ID Tags) housed in a double layer of PFA (Fluororesin) to the cartons or pallets, and in addition to the product name, weight, and quantity, store information regarding the data and place of production, the best-before date, and the destination direction in the Data Carriers. Perform sorting and delivery work after confirming safety using the production date and best-before date information obtained from the Data Carriers and issue a form itemizing the relevant information. Problems: Using (paper) instruction sheets leads to incorrect combinations due to misplacement. When incorrect combinations occur, they are not discovered until the final inspection process. In each process, read combination information from the ID Tags mounted to the containers and add the specified weight of each raw material from the hoppers. Write the combination result (i.e., the weight) to the ID Tags. Problems: Using (paper) instruction sheets leads to mixing errors due to misplacement. Changing the system to accommodate new products is extremely difficult. In each process, read product and mixing information written beforehand to ID Tags mounted to the pallets, and add the specified weight of each substance from the tanks. Write the mixing result (i.e., the weight) to the ID Tags and then read this information in the inspection process to check the actual weight of the contents. Problem: Control is based on instruction sheets and so human error can occur when cassettes are mounted to the mounter. Also, in order to prevent errors, multiple reading is used. This means that work efficiency is low and personnel expenses are high. The remaining number of parts is ascertained, in cassette units, using paper and the human eye. This is insufficient for effective control and leads to large stock losses. In particular, stock inventory is not possible unless the line is stopped for several days. The parts mounted to the mounter are insufficient and there are frequent mounter stoppages due to missing parts. Read the part information (e.g. part number, part name, and quantity) written in the bar code on the part reel, and write the information to the Data Carrier (ID Tag) mounted to the cassette. After mounting the cassette to the mounter, automatically read the cassette information, check the part information and remaining quantity, and perform verification with the mounting program. Use an alarm to provide notification of cassette mounting errors and insufficiencies in remaining parts. After the mounting process is completed, write the latest information on the number of remaining parts, based on the mounter's data, to the Data Carrier. Mount an ID Tag (Data Carrier) to the magazine rack, use it to store the PCB data (lot number, model number, board size, number of boards, etc. ), then switch processes during mounting based on the ID Tag data. When mounting is finished, write completion data and mounted PCB data to the magazine rack ID Tag. Also write the result (OK/NG) of the inspection process to the ID Tag, and feed NG products back to the repair line. Mount ID Tags (Data Carriers) to dedicated cassettes that contain (several dozen) disks. Write product information, lot information, work instructions for each process, process completion flags, and instructions for the next process to the ID Tags. In each process, read the information from the ID Tags using R/W Heads mounted to the machinery, and perform processing or inspection based on this information. For inspection processes, write the inspection results (i.e., OK or NG) to the ID Tags. At the end of each process, write instructions relating to process completion flags and the next process as appropriate. At the final process, read all the information in the ID Tags, and store it in the host for lot control. Mount ID Tags to the pallets holding the rechargeable batteries for charge/discharge inspection. Write product information, lot information, and inspection conditions for each lot to the ID Tags. Change the inspection process according to this information. In addition, store process completion flags and instructions for the next process to enable process history management. When the charge/discharge inspection is finished, write classification information based on the inspection results to the ID Tags. ID Tag memory capacity is limited and so associate addresses in memory with the locations of the batteries in the pallets beforehand. To classify the batteries, read the classification information stored in the ID Tags, and perform sorting (automatically) with a robot. When the cassette rack is mounted to the mounter, the information for all of the cassettes and placement information are read by the Antenna installed on the mounter, and a comparison is made to determine whether the correct cassettes have been loaded (that is, whether the mounting program is correct). Store work instructions and information (e.g., product information, process instructions and information, process completion information, substrate information, and inspection results) in the ID Tags mounted to the cassettes to enable distributed management of the necessary information. Mount an ID Tag (a FOUP Carrier ID) and store work instructions and information (e.g., model information, process instructions, process completion information, lot information, and inspection results) in the ID Tag. Dispersed control can then be applied to the necessary information. An ID Tag (Data Carrier) is mounted to the pod containing reticles, making it easy to check and manage the reticles inside. Store information such as mold information, shot count, date of first use, and molding conditions to an ID Tag mounted to the mold. Read the mold information and molding conditions from the ID Tag using an Antenna (R/W Head) mounted to the molding machine. At the same time, read the shot count, and check that the mold is within its service life specifications. After the molding process is completed, write information (e.g., shot count) from the molding machine to the ID Tag (Data Carrier). Product information, processing information, assembly information, and inspection information are written to an ID Tag attached to a pallet. At each process, the processing information, assembly information, and inspection information are separated according to the work instructions on the ID Tag. At each inspection step, the results of the inspection are written to the ID Tag, then uploaded to the host at the final process. Safety Guard Switching Unit that is suitable for maintenance work. Safety Guard Switching Unit that is suitable for semi-automatic machines. Position detection muting is achieved for greater work efficiency using F3SJ Ver.2 Safety Light Curtain. This is convenient for moving items that would ordinarily interrupt the beams inside the detection area. This is convenient when an interrupting object is fixed in the detection area. F3SJ Ver. 2 Safety Light Curtain (Type 4) enables horizontal presence detection. OS3101 Safety Laser Scanner detects presence in areas with complex shapes. D40A Non-contact Compact Door Switch is ideal for loose doors subject to water splashes. OS3101 Safety Laser Scanner detects presence in the vicinity of a palletizing robot. F3SJ Ver. 2 Safety Light Curtain with water-resistant cases provides IP67 protection against water and dust. Even if the operator is trapped inside, the device will not restart. Flexible design of switch-mount slide key allows eight switch mounting patterns to match the opening or closing direction of the door. With this switch-mount slide key, door switch can be mounted symmetrically left and right. Detects intrusions into wide entrances to work areas using F3SJ Ver.2 Safety Light Curtain. Made possible by non-vertical application with D40A / G9SX-NS Compact Non-Contact Door Switch/Flexible Safety Unit. D4JL Guard Lock Safety-Door Switch prevents danger from being trapped inside an enclosure. Workers are discriminated from workpieces by reading the operation timing of the muting sensors located in front of the Safety Light Curtain. Safety measures for people are possible within a sensing radius of 10 m in areas where safety fences cannot be installed. The integrated monitoring of a variety of safety devices is possible by simply connecting the Safety Controller to the safety devices of existing equipment. The entry of people into the danger zones on and around high-speed machinery, such as chip inserters, can be detected. One E5EN-H/E5AN-H Temperature Controller can perform simple program control for 16 steps. You can start programs with event inputs. You can monitor the current bank number or remaining soak time on the three displays. You can easily set temperatures for the E5EN-H/E5AN-H with the CX-Thermo Support Software and the infrared communications port on the front of the E5EN-H/E5AN-H. This Temperature Controller helps improve the response to external disturbance that results from inconsistencies in the air from air heaters to increase control performance. High-speed sampling at 60 ms provides high-speed response and robust tuning. This improves the response to external disturbance, such as inconsistencies from air heaters. This Temperature Controller provides the performance that is needed for industrial hot air blowers and it also enables downsizing. Displays are possible below the decimal point even for temperatures above 1,000°C. You can switch between three colors to clearly show the current status. Independent PID constant settings for heating control and cooling control. The EJ1 Modular Temperature Controller performs control using independent PID constants for the heating and cooling control systems. It can also perform stable control for control systems that have different response characteristics for heating and cooling. Ideal for temperature monitoring of multi-point heaters. With an EJ1 Modular Temperature Controller, it is easy to perform integrated processing for temperature monitoring and high-precision control with multi-point heaters in simple, waste-free systems. Equipment and panel downsizing by using DIN 48 x 24 mm components. Reduce panel usage from 1/2 to 1/4 by using the E5GN Temperature Controller, K3GN Digital Panel Meter, and H8GN Electronic Timer/Counter. Uniform oven temperature by using linked Temperature Controllers. Use an external analog signal (4 to 20 mA) as the set point (SP). Uniform oven temperature with a total of three Temperature Controllers. Use the Temperature Controller's transfer output for zone control in electric ovens. Achieve high-precision temperature control in conveyor ovens by adding a temperature sensor near the PCB. Cascade control is performed with a High-speed, High-precision Digital Temperature Controller with multiple outputs. Use a Power Controller to control the temperature of the electric furnace. Heater burnout could not be detected based on current output, but the loop break alarm function will detect it. The LBA (loop break alarm) turns the alarm signal ON by assuming the occurrence of a control loop failure if there is no input change with the control output set to the highest or lowest value. Therefore, this function can be used to detect control loop errors. Problem: All Temperature Controllers Are Set from a Personal Computer when Changes Are Required. The Temperature Controller setting software (CX-Thermo Support Software) is used for batch setting of Temperature Controllers from a personal computer. Settings such as control parameter setting, equipment fine tuning or maintenance work can be changed easily from the personal computer in significantly less time. Heating pattern control for constant-temperature tanks. Time-sequence temperature control for constant-temperature tanks is automatically controlled by the internal program. Prevent waste by controlling sand and coloring liquid's ratio to maintain a constant sand-to-dye ratio. Using E5AR cascade control function to achieve stable internal temperature during automotive coating process. The SP (set point) ramp function of the E5CN Temperature Controller prevents rapid heating of the workpiece and enables smooth temperature increase. Fire prevention in pulverization process of Urethane foam. Temperature is monitored because of the possibility of fire due to heat in the foam debris in the foam pulverization process. Visibility when an error occurs is improved by setting the parameters to change the color of the present value on the Temperature Controller. Low-cost safety measures using temperature control redundancy in the frying process. Low-cost redundant temperature control monitoring for fryers is performed by using two Temperature Controllers. Easy switching of temperature settings by bread type. Temperature settings can be registered for up to eight banks by using the bank function of the E5EN-H Temperature Controller. Easily perform external temperature settings according to the type of bread. An ES1 Infrared Thermosensor is used to measure the temperature because the cream filling is still warm following injection. The Infrared Thermosensor is used for hygiene. Apply E5EK Digital Controllers for cascade control and apply object temperature sensing for heater temperature control. With two thermo sensors, fine temperature between furnace and actual object can be adjusted. Problem: It has become necessary to keep the combustion temperature at 800ºC or higher to cope with the problem of dioxin from the incinerator. Use a Temperature Controller to keep the temperature constantly at 800ºC or above. When the temperature exceeds a preset level, turn OFF the burner. Problem: Red displays cannot be used on a film production line because the film is sensitive to red light. Change the Present Value (PV) display to green in the display color function of E5CN. Cover other unnecessary display area. Use the E5AR to solve the problem with less expense in comparison with a PLC (with an AD function). Do the SP switching for the Temperature Controller and the control switching by external input. Do the forward/reverse operation switching via a PLC. Problem: The client is using a spindle motor, but unless the cooling water is linked to indoor temperature, condensation occurs, leading to motor damage and lost work time. Use the remote SP for heating and cooling control (linked to indoor temperature) and high-speed control to accurately synchronize with indoor temperature. Condensation will not occur, preventing damage to the motor. Use the high-speed sampling and high-speed response features of the E5AR to prevent color spraying irregularities. Connect a flow meter to the E5ER for high-speed sampling to stabilize the discharge quantity. Problem: The client requires two inputs and two outputs. Using a standard E5AR unit with two inputs. Use the proportional control function of the E5AR to change the ratio of output for uniformed temperature control. Problem: Temperature need to be repeated between 200°C and 500ºC. Using bank selection function in E5AR to switch between two temperature. Use E5AR with analog output range of 4 to 20 mA to assign values using remote SP. Settings on multiple Temperature Controllers to change when the Master Temperature Controller set values changes is possible. Problem: Using our existing 4 to 20mA transmission output to send signals about 40 to 50 meters to the measurement room without having to pay extremely high cable costs. Furthermore, a large number of Temperature Controllers per device (about 25, including 12 for control and 12 for alarms) are required, and space constraint in the heating device control panel. Change the present 4- to 20-mA transmission output to RS-485 for a major education in wiring and labor. Use E5ZN Modular Temperature Controllers to save space. When the crucible temperature (sensor 1) is used for control, the crucible itself reaches the set temperature, but the liquid does not. By using cascade control, if sensor 2 and 3 are used for control, the response is slow and sufficient control is sufficient. Bottom line: The liquid temperature needs to reach the set temperature as quick as possible. Use the event input of the E5AR to change the SP according to the type of belt. The outlet temperature is under cascade control. Problem: In order to achieve HACCP (Hazard Analysis Critical Control Point) compliance, factories are investigating various measures for maintaining cleanliness in the food factory. Despite extensive cleaning, dust and other contaminants still enter the factory. Use positive pressurization indoors to prevent external air entering the space and also eliminate humidity, thereby keeping the indoor area clean. • Detect the differential pressure between the indoor space and external air, and use fan rotation (air flow) to control and stabilize the positive pressurization indoors. • Connect the E8Y Differential Pressure Sensor’s output (4 to 20 mA) to the E5AR, and connect the E5AR’s control output of 4 to 20mA to the Inverter. • Use high-speed control to control the high level of external interference (workers entering/exiting). Use the proportional control function of the E5ER to mix the sulfuric acid at a constant ratio. A single E5AR Unit is available for both temperature control and pressure control. A precision of ± 0.1°C or less is ensured. Problem: The client has to use two units because no single temperature unit with two selectable input points is available. A single E5_R Unit enables two input points, thus solving the problem. Problem: The temperature of water changes with the season and the mixing quantity is not constant. Use the event input of the E5AR to make PID changes between summer, mid season, and winter. Register two SVs (one for idling, one for operation) in the Temperature Controller. Use buttons on the control panel to change all Temperature Controller settings during production. Using cascade control and PID bank function to restrict the upper limit of the remote SP. Using E5AR cascade control function to stabilize internal temperature of CVD equipment. Using the Remote SP (RSP) as the Set Value (SV) to equalize the temperature of the wafer. Use the E5AR for cascade control. Input noise is mitigated. Using the multi-output capacity of the Temperature Indicator, the temperature of an industrial furnace is monitored and controlled according to the interior temperature of the furnace by detecting the interior temperature of the furnace with a thermocouple. The temperature of the roller bearing is detected by a temperature sensor and displayed on the Temperature Indicator. The output is transmitted to a computer via a communications link to monitor overheating. Changes in the amount of passing dust are detected with a photoelectric sensor at 4 to 20 mA to monitor the release of dust into the atmosphere. An alarm is given if the set value is exceeded. Excessive loads on the motor are monitored by monitoring the current to the motor. Use the startup compensation timer to prevent output due to the inrush current created when starting the motor. Centralized monitoring is performed by converting and displaying the output of a pressure sensor as a pressure value on the K3HB-X, and transmitting the linear output data of the K3HB-X to the CPU. The temperature of the exhaust dust of an engine is detected with a thermocouple to monitor the exhaust temperature with respect to the set temperature. This application controls production of workpieces on conveyors.A Photoelectric Sensor detects workpieces on a conveyor. This application uses the pulse counting mode of a K3HB-C Up/Down Counting Pulse Indicator to display values. A BCD output that is sent to the PLC or large display unit enables production management. The rotational speed of conveyors is detected with a rotary encoder to measure and control the rotational (rpm) / circumferential speed error between two conveyors. In error ratio mode, the K3HB-R Rotary Pulse Indicator converts and displays the values for monitoring. Workpiece warp of products, such as molded goods, is monitored with an attachment that transfers the action of a metal piece for detection by a linear proximity sensor and discriminated by the K3HB-X. The thickness of a decorative laminate sheet is detected with a displacement sensor. The result is judged and displayed on the Linear Sensor Indicator, and data is also sent to the PLC by BCD output for control. The concentration of a liquid mixture is monitored by detecting the flow rates of the two liquids, converting the mixture ratio for the two liquids in the Concentration Mode, and displaying the results for monitoring purpose. Also, a recorder records the data. Downsizing is achieved when the K3GN is used as the display device for measurement, inspection, and testing devices. The coating position for applying a resin coat to the handles of a knifes, which are held by a robot arm, is controlled in 32 steps. Four outputs and bank condition calculations are performed by the PLC. The temperature of a molding machine is displayed and monitored, and an alarm is output if a temperature error occurs. Temperature changes are monitored by detecting the surface temperature of the roller with an infrared temperature sensor. This process can be used to inspect the characteristics of the roller. The speed of a reflow washing machine is detected with a proximity sensor, and converted and displayed by a Rotary Pulse Meter as m/min to control the speed of the reflow washing machine. The amount of aluminum evaporation is detected using the reflectance amount detected by a photoelectric sensor. The value is converted and displayed as a percentage by scaling the linear output. This application cuts continuous Butter that moves on a conveyor into a specified size. ? A Rotary Encoder detects the feed rate on the conveyor. A K3HB-C Up/Down Counting Pulse Indicator converts and displays the Butter length proportional to the input frequency. The system controls an output with a preset value, and the contacts of the H3CR Timer cut the Butter to size. The output of the load cell of the weighing hopper is measured and control outputs are transferred to the PLC for hopper control. The amount of expelled dust is detected, displayed, and monitored by detecting the amount of dust expelled with a photoelectric sensor, scaling the linear output, converting and displaying the result as digital data, and transmitting the data to the PLC as BCD data. The distance between the sealing portion of a bag fill and seal machine is detected with a linear proximity sensor, and measured with the Process Indicator. The machine can be stopped or an alarm output if a malfunction is detected. The amount of gas remaining is measured and displayed by detecting the amount of residual gas with a load cell. Problems: Regularly replacing power supply to prevent the system going down due to a malfunction of the conventional power supply, resulting in huge administrative and regular replacement costs. Need for centralized control of maintenance information, if possible.Use the S8VS, which indicates when replacement is required. Central control enabled by sending advance replacement warning output to the PLC. External alarm indicates that replacement is required. Problems: Automatic chemical supply system stops due to unknown causes. System recovers automatically approximately 5 seconds after stopping. The PLC and other devices, however, need to be restarted. The line is operating for 24 hours, making it difficult to determine the specific cause.One factor is the Switching Power Supply’s output stopping (overcurrent protection function). Propose investigating the inrush current of the device’s load, and using a redundant power supply system and an S8TS for redundant operation. Implement redundant operation with a set of S8TS. Problems: The machine supplied to the user occasionally stops. Time and effort are spent in troubleshooting to enable recovery. Need to shorten recovery time to increase customer satisfaction.Change to a Power Supply with a display that will allow faster troubleshooting of machine problems. Customers can easily check Power Supply status on the display, letting them to know whether the Power Supply is the cause of the problem. Problems: Currently using two Power Supplies for backup operations, but the circuit configuration is complex and recovery after a malfunction is time-consuming and complicated. Change to S8TS Switching Power Supply, which provides a simple backup operation to replace conventional power supply systems. Use a system that can be constructed without specialized knowledge. Problems: One maintenance staff is usually in charge of a few production equipments. Major down time will incur if production equipment stops when factory maintenance personnel are absent. Use simple backup operation using the S8TS Switching Power Supply. A warning signal is sent if a malfunction occurs, allowing replacement when maintenance personnel are present or replacement during next maintenance. Problems: Furnaces are located near power supply, so ambient operating temperature is 50°C, and a power supply with a greater capacity than normal is required (derating curve). The number of fans and capacity often changes.Use an S8TS Switching Power Supply that can be easily expanded in 660-W blocks. Respond quickly to sudden need for increased power supply capacity. Built-in controller for vending machines. ZEN Programmable Relay is also ideal to replace PLC to save space and cost. Used as a conveyor shift unit. A sensor detects when a product has arrived, and inputs this to ZEN. ZEN then moves two stoppers and shifts the product to another conveyor. ZEN is used as the controller for water treatment device. Automatically opens and closes the swimming pool cover to prevent children from entering and leaves from falling into the pool, while also helping to keep the pool temperature constant. Problem: Dedicated controller (manufactured in-house) and controller for inverter interface.Replace with Programmable Logic Relay. One ZEN Programmable Relay can replace 10 relays, greatly simplify wiring. ZEN V2 Programmable Relay serves as an economical time switch, which turns ON the street lights along roads or in parks only at night. The K8AB-AS can detect burned out light bulbs by detecting under current levels. The Relay's sensitivity can be adjusted to detect burned out light bulbs even in applications where multiple light bulbs are used. Communications bases must be carefully monitored because the effects of a power outage or voltage drop would be highly detrimental to communications. This is why the K8AB-VW monitors the control panel power supply for over voltage and under voltage levels. A submersible pump must be turned OFF as soon as it begins to operate out of water, or it will immediately malfunction. Instantaneous detection of this kind of idle operation is essential. K8AB-VS voltage relay is used to check battery voltage and its charge level. When the motor locks up, its rotational torque may break the roller chain. To prevent that from happening, the relay must trip the instant it detects a motor lock error. A thermal relay cannot be used for chain protection because it takes too long to start operating. A Fan Ionizer removes static from PWBs just before mounting components to prevent electrostatic discharge (ESD) damage and adhesive dust. Variable DC mixing system maintains the optimal ion balance at all times. Pipe mounting bracket provided for cell production system. Self-diagnostic function to prevent missing maintenance. Prevents adhesion of foreign matter and keeps parts from sticking together due to static electricity in the parts feeder. Prevents adhesion of resin parts to the die (holdovers) because of static electricity. Prevents adherence of foreign matter to bumpers on car body production lines. Prevents adhesion of foreign matter when conveying DVDs. Prevents adhesion of foreign matter from static electricity on resin parts. Prevents adhesion of foreign matter and keeps the film from sticking to itself. Both sides of the film are ionized by Straight Bar Nozzles. Prevents foreign matter from adhering to and contaminating containers before they are packed with food. Prevents adhesion of dust and other foreign matter when labeling. Prevents adhesion of foreign matter and damage to circuits from static electricity on elements. Ionization is localized by a Flexible Tube. Prevents adhesion of foreign matter and damage to circuits from static electricity generated when conveying PCBs. Both sides of the PCB are ionized by a Straight Bar Nozzle. Prevents adhesion of foreign matter and damage to circuits from static electricity. The full width of the line is ionized by an Air Purge Ionizer. A Fan Ionizer discharges formed products, which easily collect dust due to static electricity. Combined use of the Ionizer Unit ionizes the area within the booth and prevents the adhesion of particles to the Clean Suits. The Air-cleaning Unit and Air Particle Sensor provide integrated cleaning of the work area and equipment inside Clean Rooms. The ionizer unit inside the Air-cleaning Unit works to ionize the space inside cellular manufacturing booths. The use of a long-life LED in the UV Irradiator removes worries about burnout lamps and achieves lower running costs than lamp irradiators. Spot-type UV Irradiator enables sure, high-accuracy adhesion. Two-dimensional codes containing product information, such as serial numbers and feature values, are printed onto components by direct marking. This data is read during inspections, and saved onto an SD card together with the inspection results. When the work is completed, the saved log is transferred to a database. For quality control, important metallic parts affecting safety are physically managed by inscribing them with 2-dimensional codes. For example, when assembling engines, the 2-dimensional code is read and linked to the engine number, and this data is stored in a database for history management. Physical management is possible by attaching labels containing 1-dimensional or 2-dimensional codes (with model numbers, lot numbers, production history, inspection data, etc.) to PCBs. Production data (serial number, lot number, etc.) is attached to each part using labels that have 1-dimensional or 2-dimensional codes. By reading the code for each part during assembly, a link can be made that shows which part was used in which product, and this data can be stored in a database. For quality control, important components affecting safety are physically managed by attaching 2-dimensional code labels to them. For example, when assembling engines, the 2-dimensional code of the part is read and linked to the engine number, and this data is stored in a database for history management. Product information, serial numbers, lot data, etc., is written into 2-dimensional codes and printed onto labels that are attached to individual boxes. Because the data cannot be visually confirmed by using only the 2-dimensional codes, the necessary data is also printed in text form. The 2-dimensional codes are read when shipping the individual boxes, and when the individual boxes are received by the customer. Two-dimensional codes containing product information, lot information, serial numbers, etc., are printed directly onto LCD substrates using a laser marker or exposure device, and the 2-dimensional codes are read at each process. Small, 4 mm x 4 mm 2-dimensional codes (with product number, lot number, production history, inspection history, etc.) are inscribed onto PCBs with direct marking for physical management. For quality control, important automotive components affecting safety are physically managed by inscribing them with 2-dimensional codes. For example, when assembling engines, the 2-dimensional code is read and linked to the engine number, and this data is stored in a database for history management. Problem: In order to compile a production control history, data such as the lot number, serial number, and production date has to be documented for each panel. Using a paper-based system, though, makes it difficult to achieve complete production control starting at the initial stages of the process. It would be helpful if the panels could be controlled individually instead of in lots. Use an exposure device to directly mark each panel with a 2-dimensional code containing the production data for the glass substrate and the process history data. Read the 2-dimensional codes with a 2-dimensional Code Reader, and control the entire production process over a network. Problem: Until now, in the production of DRAM, for example, wafers have usually been processed in lots of 25 (i.e., in wafer carrier units). The switch, however, towards high-diversity, low-volume production (e.g., custom LSI) has made individual wafer control necessary. In order to avoid reducing the number of IC chips produced per wafer, the markings used for individual wafer control must be as small as possible. Mark the back surface of each wafer with wafer ID (2-dimensional code) satisfying the specifications of the SEMI T7 standards using a laser marker. (The surface can be marked with a wafer ID consisting of 13 alphanumeric characters in an area of 4 × 1 mm.) When the wafers are introduced into the processing equipment, read the wafer ID (2-dimensional code) with a 2-Dimensional Code Reader and send the information to the equipment. Two-dimensional codes containing product information, lot information, serial numbers, etc., are printed directly onto LCD substrates using an exposure device or laser marker, and the 2-dimensional codes are read at each process. In locations where people are involved, a handheld reader is used.